Ahh, the art of the Rorschach. 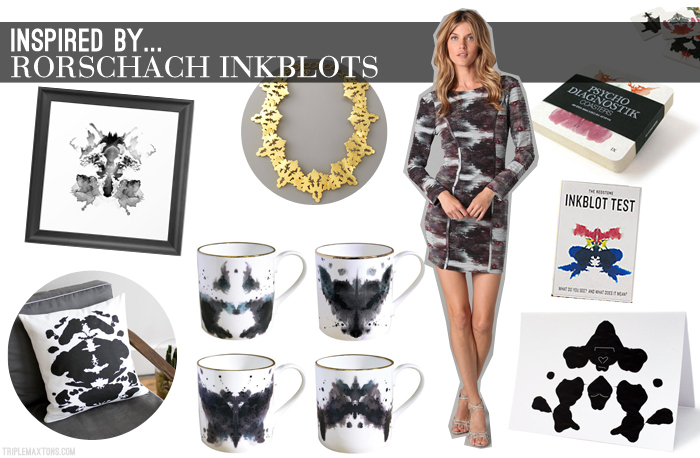 Those little ink blots that are supposed to unveil the deepest, darkest secrets of the psyche. For starters, I see animals...foxes, gorillas, and wolves. Must mean I am channeling my inner wild child, no? ;) Ahh but alas, a good girl never kisses and tells, so let's leave the evaluations for another day, ok? Great. Glad we got that settled. Anyways, wouldn't this make a cool D.I.Y. art project? Get some ink, paper, drizzle, fold, squish....BAM! Intellectual art for the ages that didn't cost more than a few dollars. Plus, it would be pretty fun to grill any guests you have over and see what they read into your custom wall art. You can thank me later for confirming the fact that your aunt Gertrude is indeed a little 'off her rocker', if you catch my drift. Love love love this! I want everything!